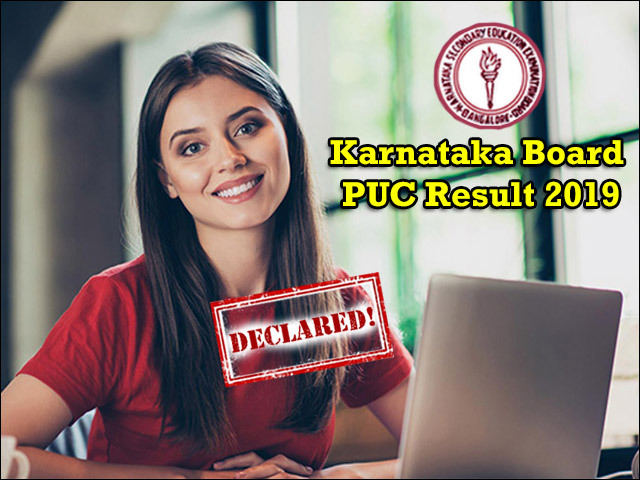 2nd PUC Karnataka Result 2019: The wait for Karnataka PUC result 2019 is over. The Department of Pre-University Education has declared the Karnataka 2nd PUC result 2019 online for all the streams. Students can check their PUC result 2019 online at the official websites - karresults.nic.in or pue.kar.ac.in . The press conference highlighted some key aspects of the Karnataka PUC Result 2019 including the overall pass percentage at 61.73%. The pass percentage of girls stood at 68.2%. In addition to this, the pass percentage of Science stream students is 66.58% and 66.39% in case of Commerce Stream. As per the media reports, Udupi district has the highest pass percentage, followed by the Kannada district. The declaration of Karnataka Board PUC result 2019 online will benefit the students as they can check the same without any inconvenience. DPUE has also provided an SMS facility where the students can access their Karnataka 2nd PUC Result 2019 by means of an SMS. According to the official announcement, the Karnataka 2nd PUC Result 2019 was formally declared in a ceremony at the DPUE office in Bengaluru at 11 AM today. The original marksheets and passing certificate for the students of Class 12 will be issued in the respective Junior Colleges from 16th April – Tuesday onwards. This year, nearly 6.5 lakh students from Class 12 have appeared for the 2nd Pre University Exam 2019. The exam was held from 1st March to 18th March 2019 and the result is being declared earlier than the usual date. In fact, this will be first time that the IInd PUC Result 2019 is being announced even before the completion of the Common Entrance Test 2019 / CET 2019 exam. This year, the CET 2019 will be held on 29th and 30th April 2019. Taking into account the early declaration of the 2nd PUC Result 2019, the Board is now expecting the number of students participating in CET 2019 to dip, as students who didn’t do well in the science stream will not be appearing for the entrance exam. How to check Karnataka 2nd PUC Result 2019 Online? As lakhs of students will try and access the 2nd PUC Result 2019 online at the same time. This means that the official website of the Karnataka Board i.e. karresults.nic.in and pue.kar.nic.in, may suffer from technical problems or glitches. To help students avoid such a situation, we have listed down the key steps involved in the result checking process of Karnataka IInd PUC Result 2019. The steps can be followed by anyone to check the results online. For more news and latest updates related to Karnataka 2nd PUC Result 2019, please visit www.jagranjosh.com/results.